Located in the midst of the Sierra Nevada Mountains of California, Yosemite National Park is a natural treasure home to 800 miles of hiking adventures, according to Thrillist. While some can only dream of a visit to this iconic park, others return again and again to explore yet another untouched trail or waterfall. If you find yourself on a road trip down the West Coast, hiking some of the most incredible trails of Yosemite is a must. At moderate difficulty, this eight-mile hike brings you high in elevation rather quickly, so be prepared, according to Thrillist. After the first section of this hike, the climb evens out and it shouldn't take you too long to reach Cathedral Peak, named for its similarities to the steeple of a church. If you plan your hike right, catching the sunset along either the Lower or Upper Cathedral Lake will be enough to make you stop in your tracks - so don't forget your camera! Keep in mind that the road needed to access this hike, Tioga Road, is typically only open June through October. As the National Park Service explained, the Wawona and Mariposa Grove area of Yosemite offers a number of great day hikes. For an easy to moderate trail that's great for families and kids, check out the Swinging Bridge Loop at just under five miles. It starts at the old Wawona Store, now called the Big Trees Lodge Store, and takes most people about two hours round trip. One of the best parts of this hike is that you can take the Chilnualna Falls Road to the Pioneer Yosemite History Center, providing more than just trekking on this trail. For the avid hiker looking for a difficult trail along the picturesque Glacier Point Road, make a stop at The Pohono Trail head, advised Yosemite Hikes. With a complete view of the Yosemite Valley, the number of other peaks, waterfalls and landmarks you'll see along the way is unmatched as well. Among many sights for sore eyes are the Half Dome, Cathedral Rocks, Bridalveil Falls and Sentinel. At 13 miles one way, the estimated hike time ranges from five to 10 hours, depending on experience and fitness as well as how many of the landmarks you stop to soak in. 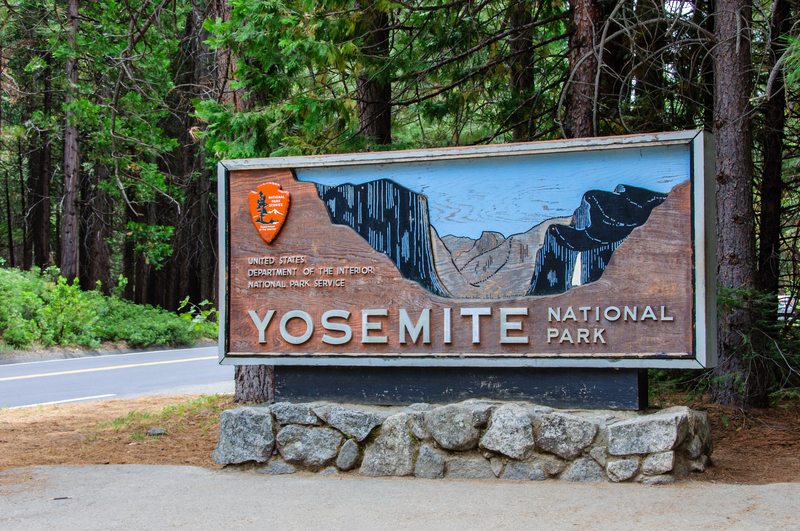 As Yosemite Hikes explained, a somewhat easier route would be starting at Glacier Point and ending at Tunnel View, rather than the other way around. According to Earth Trekkers, the Half Dome is one of the most well-known peaks throughout the whole of Yosemite National Park. Rising up above the lush green treetops, this summit reflects its name rather precisely and peaks at 4,800 feet. As Thrillist explained, however, you will need a permit to access this trail, as it is known for being quite treacherous. Nearing the top, cables are provided to help hikers finish the climb. As such, it's a popular place for rock climbers. For a moderate to difficult day hike that can take several hours to complete, consider the Chilnualna Falls trail that first follows along the rushing water and then takes you through the forest, according to the National Park Service. Once in the clearing, you'll get a great view of Wawona. At 4.1 miles each way, this trail can be tackled in a morning if you beat the sunrise. However, with the creek and the falls, it's also a great place to enjoy a picnic-style lunch of peanut butter and jellies as well as a well-deserved water break. With so many diverse trails and landscapes, you'll never get bored of hiking through Yosemite. Be sure to stay on top of your routes and excursions with the WSD-F20WE Smart Outdoor Watch, equipped with digital compass, bearing memory, altitude graph, barometer and more.